I don’t read much non-fiction. What can I say, I like stories. 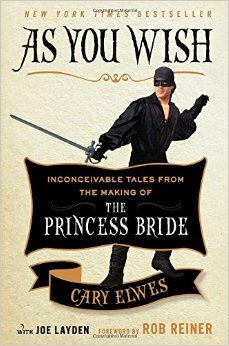 But As You Wish: Inconceivable Tales from the Making of The Princess Bride by Cary Elwes (Westley) with Joe Layden is a first class example of the best kind of non-fiction. It tells the story of real-life events. Who doesn’t love The Princess Bride? It’s one of the greatest films ever. It turns out the magic we all saw on the screen was largely a result of some magic happening behind-the-scenes. The perfect script, director, cast, and crew all converged to create something special. And you don’t have to take just Elwes’s word for it. The main narrative from Elwes is broken up often by anecdotes from all of the film’s surviving cast members. Every last one of them looks back at the making of this picture as a highlight not just of their careers, but of their lives. As You Wish is non-fiction but I flew through it like it was a compelling novel. I recommend this one, and my friend Will says it’s even better in audiobook. Regardless of which format you choose to read it in, have fun storming the castle.